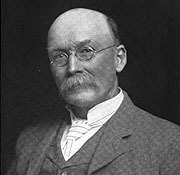 Bellingham architect William Cox was born on February 27, 1842 in Lincoln County, England. He attended school in England and at the age of fourteen began working on the farm with his parents. At sixteen he decided to learn the trade of wagon building and continued in that profession until the age of twenty-one when he took up carpentry and house building in the city of Lincoln. Eventually he included design work in his business. With no formal architectural training at hand, in 1887 Cox immigrated to the United States with his family and reportedly worked as an architect in New York. Then in 1889 he moved to the growing town of Bellingham Bay and opened up an independent architectural practice. Cox’s earliest documented work is the grand three-story Italianate style Roeder-Roth Home (1897) which sat at the northwest corner of Elm and Monroe in Bellingham (demolished in 1956). Other residential commissions followed for some of the regions most prominent citizens, as well as designs for several working class homes and apartment complexes. Known projects include the Dr. H.J. Birney House (1905); two homes on Potter Street in the York Addition for builder Charles Graham (1908); the Shields Flats (1909); the Glencairn Apartments; the E.H. Hatch House (1909) all in Bellingham; and the J. Edwards House (1910) in Sedro-Wooley. His commercial work included the Byron Hotel (c.1895); the Nelson Bank Block (1900) in Fairhaven; Moultray – Kershaw Building (1905); the P.L.F. Clubhouse (1904); Verstaddig & Co. Store (1905); Roehl Block (1908); The Mitchell Block (1910) in Blaine; an addition to the Elks building (1912); the Bellingham Fire Hall (1908); a four-classroom school building (1910) in Concrete; and Washington and Columbia Schools. In addition to practicing architecture, Cox was involved in several other successful businesses and dabbled in real estate. Early on in 1895 he purchased the Bellingham Bay Gurney Cab & Transfer Company and reorganized the businesses under the name Cox Brothers with the help of his sons. He also held interest in the Canadian-American Mining Company (a cooper mine), eventually becoming president of the corporation. With his workload increasing, Cox partnered with the young architectural firm of Piper & Carder to help him execute some projects. F. Stanley Piper was a fellow British ex-patriot and unlike Cox was formally trained in the architectural profession. Together they designed the Anacortes Public Library (1909); and Kulshan Clubhouse (1909) in Bellingham. Cox retired due to his failing eyesight around 1912 and passed away in Bellingham on April 29, 1921.